Even though I haven't had to use my generator, crack into one of my 8,000 canned goods or fire off any ammunition, I somehow survived Carmageddon. 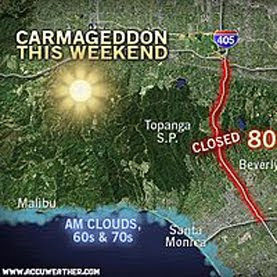 I was pretty sure the closure of part of the 405 Freeway in Los Angeles this weekend - universally known as Carmageddon - would not only mean death to the Southland, but the end of the continental United States, Mexico and Canada. With so many people surviving, I guess I'll have to take all of my Y2K supplies back outside to my Unabomber shed. Oh well. But, seriously, I was sort of hoping people might reflect on modern-day living and our ridiculous dependence on the automobile. Yeah, that didn't really happen, but at least I reflected - mostly on the word "Armageddon" and rock band Def Leppard. Def Leppard has a rock anthem titled "Armageddon It," and in the song, these lyrics exist: "Are you gettin' it? Armageddon It. Really getting it? Armageddon it." Even though the song came out in 1987, I still chuckle at its ridiculousness. The lyrics are so cryptic, there is an outside chance the song was ahead of its time and actually is about this weekend's Carmageddon. 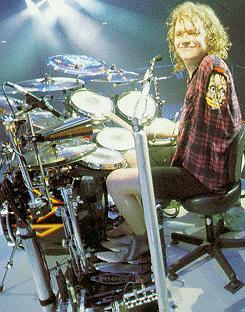 Another brilliant aspect of Def Leppard is that its drummer, Rick Allen, has only one arm. Through extensive Internet research, I have discovered that he joined Def Leppard when he was 15 and lost his arm in a car accident on New Year's Eve 1984, when he was 21. I imagine Rick Allen is an inspiration for many drummers with disabilities. He somehow should be the poster boy for Carmageddon.